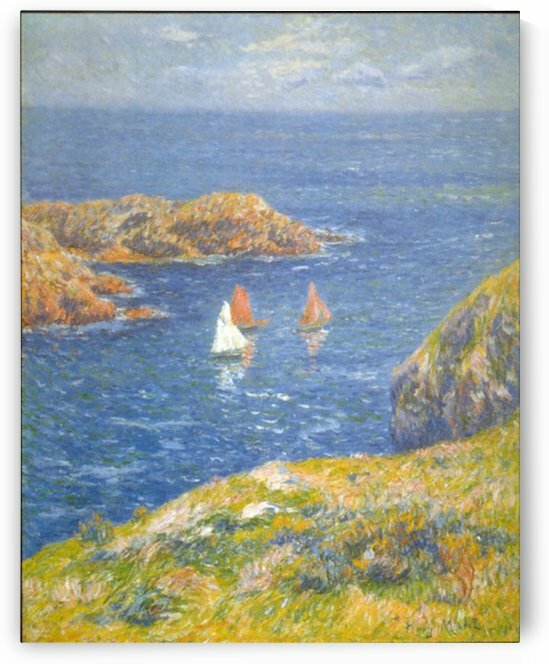 Henry Moret (12 December 1856, Cherbourg – 5 May 1913, Paris) was a French Impressionist painter. He was one of the artists who associated with Paul Gauguin at Pont-Aven in Brittany. He is best known for his involvement in the Pont-Aven artist colony and his richly colored landscapes of coastal Brittany. Little is known of Morets life until he began his military service in 1875. Jules La Villette, his commander in Lorient, who first noticed his artistic talents, introduced him to Ernest Corroller, a drawing teacher and marine painter. Corroller taught him the art of landscape painting as practiced by masters such as Corot and Courbet, enabling him to register at the École des Beaux-Arts in Paris where in 1876 he studied under Rudolf Lehmann, Jean-Léon Gérôme and later, from about 1880, under the history painter Jean-Paul Laurens at the Académie Julian.